SPACEPORT NEWS Page 3 Feb. 27, 2004By Linda Herridge Staff WriterChuck Dovales secret ambition is to become a professional guitar player. Though his musical career hasnt yet launched, he excels in his day job as launch director for eastern and western range launch sites in KSCs Launch Services Program (LSP). Dovale has been in this position since March 1999. The Launch Services Program came from a consolidation of the Expendable Launch Vehicle and Payload Carriers Programs, said Dovale. The work hasnt really changed much with the consolidation. Were looking toward the future with a major focus on unmanned launches. Dovales responsibilities include providing the contractor with the single go/no-go decision for the NASA community during the launch campaign. His team also oversees spacecraft testing and integration with launch vehicles, while he provides NASA Headquarters the manifest support for launch schedules. Current programs in progress within the LSP include the Orbital Space Plane (OSP) and the Jupiter Icy Moon OrbiterDovale dreams of launching more than rocketsNASA LAUNCH DIRECTOR Chuck Dovale (center) confers with Jim Meyer (right), launch operations manager and James Wood, chief engineer during a recent mission. (JIMO) mission. The projects require interface with NASAs Marshall Space Flight Center for OSP and the Jet Propulsion Labs Prometheus Program for JIMO, which is scheduled to launch as early as 2012. Dovale is involved in a significant future mission, the Mercury Surface Space Environment Geochemistry and Ranging (MESSENGER) spacecraft, which will perform two flybys and then orbit Mercury. The mission, scheduled to launch in May, is historic because it will be the first orbital study of the innermost planet. Mariner 10 made the last flybys of Mercury in 1974 and 1975. Dovale, a native of Long Island, N.Y., left the state in his last year of high school and settled in Brevard County. He started as a summer hire with NASA at KSC in 1982 and became a co-op in the expendable launch vehicle directorate in 1984. Twenty years later, Dovale still calls the ELV program home. His responsibilities as LSP director have taken him to launch sites in Kodiak, Alaska, and Vandenberg Air Force Base, Calif., among others. His love of rock music keeps him traveling around the country as well. Dovales moment of fame includes an appearance in a music video filmed at Hard Rock Live in Orlando for the rock group Staind, and meeting David Letterman in New York in 1998, where they discussed the Mars Observer mission. Dovale, married to wife Laura for 14 years, has two children: Paige, 8, and Kaley, 6. He enjoys spending time with them and playing his acoustic and electric guitars.The KSC Fitness Centers now offer two new ways to get in shape. During the month of March, participate in the Spring 2004 Indoor Triathlon for individuals or relay teams. The Distance Triathlon consists of 10miles on an upright bike, a 1-1/4 mile row on a rowing machine and 3.1 miles on a treadmill. The Sprint Triathlon for individuals includes a 5-mile upright bike ride, a -mile row on a rowing machine and two miles on a treadmill. Prizes will be awarded. For information, call 867-7829 (O&C) or 861-Are you ready to take control of your health?3028 (OSB). Also, join the KSC Fitness Centers new nutrition lecture series, Changing Weighs. The hour-long sessions take place in the O&C Mission Briefing Room (MBR). All talks begin at 11 a.m. Mar. 10 Getting Back On Track with Nutrition Basics (alternate location: O&C Room 1055) April 14 Psychology of Overeating and Eating Normally (alternate: O&C Room 1055) May 12 Dangers of Fad Diets June 9 Dissecting Food Labels July 14 Functional Eating: Foods to Prevent Disease Aug. 11 Setting Goals: An Inspirational StoryFebruary Employees of the MonthSTANDING IN THE BACK ROW, from left, are: Maria Bland, Cape Canaveral Spaceport Management Office/Chief Financial Office; Nancy Zeiltin, Spaceport Engineering and Technology; Michael Payne, Shuttle Processing. Standing in the front row, from left, are: Penny Chambers, Chief Council; Lisa Brawn, ISS/Payload Processing; Maxine Johnson, Executive Staff Not shown are: Juan Busto, Information Technology and Communications Services; Michael Wheeler, Procurement Office; Don Slayman, Spaceport Services; Tom Palo, Launch Services Program. Page 4 SPACEPORT NEWS Feb. 27, 2004 AT LEFT, NASA ADMINISTRATOR Sean O'Keefe (center) listens to Congressman Tom Feeney (second from left) during a tour of the Central Florida Research Park, near Orlando. At right is U.S. Congressman Dave Weldon. Central Florida leaders are proposing the research park as the site for the new NASA Shared Services Center. Six sites around the U.S. are under consideration by NASA. Above, KSC Director Jim Kennedy makes a presentation to NASA and other officials about the benefits of locating the new center in the Central Florida Research Park, near Orlando.O'Keefe tours proposed NASA site in OrlandoBy Jeff Stuckey EditorTampa seventh-grade student Melissa Brewster, dressed in a blue NASA astronaut training suit, has her sights set beyond Mars exploration. I would like to be a pilot and learn to fly future spacecraft, Melissa says. With confidence and no hesitation, she adds, I also want to be the first woman to walk on Venus. Melissa and 60 of her fellow students were a captive audience as KSC Director Jim Kennedy and NASA astronaut Kay Hire spoke to students at Stewart Middle Magnet School, a NASA Explorer School (NES) in Tampa, on Feb. 20. The event was part of the Agencys effort to share President George W. Bushs new vision for space exploration with the next generation of explorers. Twenty-six of the students, dressed in identical astronaut suits, comprise the schools John Glenn Top Gun Academy. This group learned even more about NASA last summer when the NES school, only one of four inKennedy 'explores' NASA's vision with Tampa studentsFlorida, toured KSC. Each year, NES education teams work with NASA personnel to develop action plans for staff and students. The plan promotes the use of NASA content and programs that address the teams local needs in mathematics, science and technology through authentic experiences. Kennedys presentation focused on NASAs stepping stone approach to exploring the Moon, Mars and other planets. He also discussed ways space impacts our lives and how people and machines rely on each other in space. We want you to be a part of our program one day, if you would like to be, he said. As part of the vision the President announced last month, we are going to take people to Mars and its going to be done with you, in the middle school age group, who will be the astronauts for that mission. The center director then introduced an inspiring 5-minute video highlighting the Presidents announcement at NASA Headquarters. He then reminded the students to take advantage of the opportunity they have been given as students in an Explorer School. There are only 50 Explorer schools in the world and one of them is right here in Tampa, Florida, at the Stewart Middle Magnet School, Kennedy said. I am so proud of you and your teachers, who I know worked so hard to compete with all the other contenders for this program. As excited as the students were to hear from the center director, they were equally excited to meet a NASA astronaut. Although I love my work, I also love coming to spend time with you because I can tell that you are interested in space, Hire said. We need new technology that does not exist today. We need your creative minds to come up with new ideas and to come and share those ideas with NASA. We need you on our team. For information about NES on the Internet, visit: http:// explorerschools.nasa.govKSC DIRECTOR JIM KENNEDY addresses students, teachers and parents at Stewart Middle Magnet School, a NASA Explorer School in Tampa, Feb 20. Page 5 SPACEPORT NEWS Feb. 27, 2004 By Anna Heiney Staff WriterWhen it comes to launching and landing Space Shuttles, NASA and the U.S. Air Force expect the best. But they also know the importance of preparing for the worst. They put themselves to the test Feb. 18 when they rescued seven injured astronauts from a Shuttle orbiter that landed short of its runway at KSC. Fortunately, it was just a simulation. The astronauts were healthy volunteers and the orbiter was only a life-sized mockup of the crew compartment. Called a Mode VII, the exercise is meant to give NASA and the Department of Defense hands-on experience in responding to Shuttle emergencies. Emergency personnel and landing team members were readying for landing when Landing and Recovery Director Robert Holl declared the emergency: The orbiter had come down south of the Shuttle Landing Facility. NASAs fire-rescue helicopter began a search from the air and spotted the crash site in an area full of small ponds. Four Air Force search-and-rescue helicopters arrived next. Normally based at nearby Patrick Air Force Base,Rescuers respond to mock Shuttle mishapthe helicopters are always present at KSC for Shuttle launches and landings. One by one, the Air Force helicopters landed and deployed teams of para-rescuers. Wearing gas masks and silver suits for protection, the rescue team entered the crew compartment through the top hatch. Some crew members were evacuated that way; others were carried out the side hatch. Main access was through the top, then we opened the side hatch from the inside, said Norb Kuhman, fire chief and rescue operations commander with Space Gateway Services. We were just making sure we exercised both elements. The crew members were taken by helicopter or M-113 armored personnel carrier to a nearby emergency treatment area. Only 43 minutes elapsed from the time the emergency was declared until all crew members were rescued from the orbiter. They did great, Lt. Col. John Bickett, commander of Department of Defense Management for Space Shuttle Support. But were going to see what we did as planned, and what could be done even better.EMERGENCY CREW MEMBERS (above) lower a volunteer "astronaut" from the top of the orbiter crew compartment mock-up that is the scene of a Mode VII emergency landing simulation at KSC. Below an "injured" rescue worker is lifted into an M-113 armored personnel carrier provided for transportation during the Mode VII simulation. A HELICOPTER RESCUE TEAM prepares another "injured" astronaut for transportation to a local hospital, part of an emergency landing simulation to exercise emergency preparedness personnel, equipment and facilities. 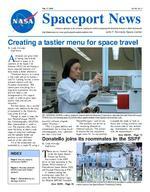 Page 6 SPACEPORT NEWS Feb. 27, 2004was transferred from a storage area in the Operations and Support Building to a test stand in the high bay of the SSPF. For the first time since its arrival at KSC in February 2001, Donatello now sits in the SSPF with its fellow modules, Raffaello and Leonardo. Since Donatello has never flown on a Space Shuttle mission, the module will undergo preparations for risk mitigation, or active MPLM testing, to confirm it will function properly in space. Power, data and cooling service will be provided to as many as five rack locations to simulate the Shuttle side of the interface. Tests and upgrades will verify all systems work and reduce the risk of incompatibilities during its first active mission, currently scheduled for 2007. The upgrades and verification testing of Donatello will confirm that the ISS can support the new Space Policy, by providing a much greater capability to launch and return a large variety of life science experiment, and redirect or refocus the research to exploring factors affecting astronaut health, Talone said. Workers from the Space Shuttle and ISS programs from KSC, Johnson Space Center and Marshall Space Flight Center are working on the upgrades and testing. Raffaello, the second of three MPLMs built by the Italian Space Agency, was transferred to a cargo element test stand inside the high bay to make room for Donatello. Talone said the MPLM system will evolve from a passive provider of logistics and science to a complete service to the ISS science community. The enhancements and future missions associated with it, along with the planned integration and testing of the ISS Node 3 module, will continue to add to the existing assembly and resupply schedule for the next six years. It will challenge the NASA and contractor workforce in new and more exciting ways, Talone added. After post-delivery inspection and testing in 2001, Donatello was stored in the Operations & Checkout Building to make room for other segments scheduled for delivery to the space station. The MPLMs are reusable logistics carriers that carry equipment and supplies requiring a pressurized environment to and from the Station.SSPF ...(Continued from Page 1) Johnson Controls, the visual information contractor at the Spaceport, recently received three Crystal Reel Awards at the Florida Motion Picture and Television Association annual awards banquet. The groups television documentary, John Glenn Recalls the Flight of Friendship Seven, took honors in categories including Best Produced Script for a Documentary, Best Editing for a Documentary and Best Musical Score. The documentary will next be judged in the American Film Industry Silver Doc film festival in June. The team used original NASA-archived film footage for the project, worked on by Director Jim Cain, executive producer Bud Wellman, video editor Mike Chambers, retired newscaster Bill Larson and beauty consultant Maureen Mulholland.Johnson Controls wins Florida video award, nominated for national recognitionMEMBERS OF award-winning production team include (from left) Jim Cain, Mike Chambers, Maureen Mulholland, Bill Larson and Bud Wellman.KSCs Black Employee Strategy Team (BEST) hosted the 2004 AfricanAmerican History Month Luncheon Feb. 20 at the Debus Conference Center. The event was open to all NASA civil servant and contractor employees. Dr. Woodrow Whitlow, KSC deputy director, opened the program by saying, Im very pleased to see such a diverse group of people here to celebrate African American History Month. During a delicious buffet lunch, attendees viewed a moving video retrospective of significant events and contributions by African-Americans. Keynote speaker Dr. Dorothy Hayden-Watkins, assistant administrator for Equal Opportunity Programs at NASA Headquarters, spoke to a sold-out crowd at the event. We have come a long way, Hayden-Watkins began, and we have a long way to go. But we have to stop occasionally and celebrate the successes, progress and achievements we have made. And we have to honor those, such as Thurgood Marshall and those, black and white, who worked together to made the strides that we celebrate. Hayden-Watkins stressed the importance of promoting the similarities people of color share with other races, rather than seeing differences that are divisive. Elaine Johnson, daughter of the late former KSC EO Deputy Director Evelyn Johnson, awarded two scholarships in her mothers name to college students Monique Bland and Tiffany Lindsley, who are in the Stay-in-School Program. Both work in the External Relations and New Business Directorate and are attending Brevard Community College. BEST Chairperson, Derwood McKinley, announced the BEST Leadership Recognition award winners are William Gary, an engineer in the International Space Station/Payload Processing Directorate, and Kimberly Jenkins, an engineer in the Safety, Health and Independent Assessment Directorate. The award recognizes two members who represent contributions within BEST, NASA and the local community.Celebrating the successes of African-AmericansKEYNOTE SPEAKER Dr. Dorothy Hayden-Watkins, assistant administrator for Equal Opportunity Programs at NASA Headquarters, spoke to a sold-out crowd at the 2004 African-American History Month luncheon.